Some of the Democrats at the Connecticut Hispanic Democratic Caucus event: Jonathan Harris, Sean Connolly, Susan Bysiewicz and Guy Smith. The challenge: convince well-connected Hispanic politicos why you’re the best candidate to represent them in statewide office — and do it in under one minute. 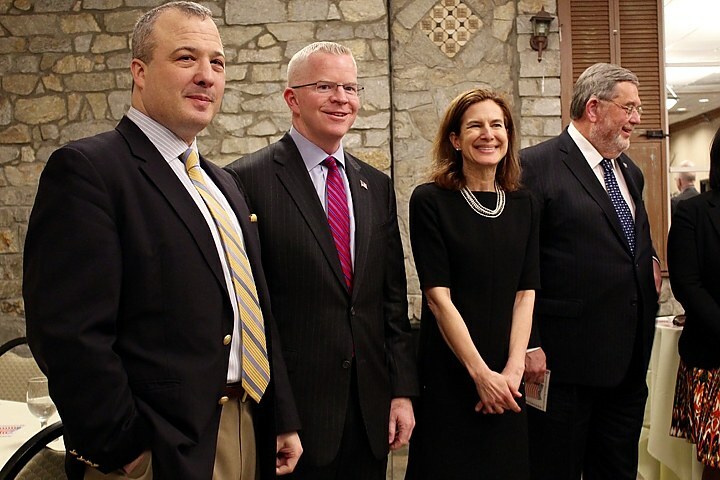 That round of speed-dating, involving four potential governors, three treasurers, two attorneys general, one comptroller and the Connecticut Hispanic Democratic Caucus, took place Wednesday at a New Haven gathering at the Greek Olive on Long Wharf. With the clock racing, the crowded field of Democratic candidates tried to differentiate themselves by giving similar short pitches, touching on their resistance to the Trump administration and the kitchen-table issue of good jobs. A couple threw in rehearsed lines of Spanish. Currently, only one Hispanic is officially running for statewide office. Connecticut has never elected one. Yet Latinos comprise the fastest-growing segment of the population; Latinos involved in politics have been pushing their parties to diversify their tickets. The four 2018 Democratic candidates for governor, two for attorney general and one for comptroller who showed up Wednesday night are all white. The candidates for treasurer included an African-American man, a man of Sri Lankan descent and an Indian-American woman. 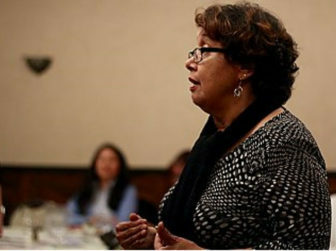 Eva Bermudez Zimmerman, a union organizer in Newtown considering a run for lieutenant governor or secretary of the state, was the one Latina who spoke to the voters. Despite the lack of representation on the ticket, the candidates all know that Hispanic voters will be a powerful voting bloc that could play a role in deciding the front-runners from among a wide field of candidates. At the end of the meeting, the caucus members started counting up the delegates they’ll send to the Democratic convention next month, where candidates need to draw at least 15 percent support to make it on the primary ballot. In conversations with a reporter during a meet-and-greet hour, some of the candidates struggled to get specific about what they plan to do for the Hispanic community. All those aiming for the governor’s mansion expressed a willingness to revisit the Connecticut Trust Act, which prohibits state law enforcement from coordinating with federal immigration agents — with seven broad exceptions, such as if the target has had a felony conviction, been identified as a gang member or terrorist, or appeared to be an “unacceptable risk to public safety.” Advocates, like the Connecticut Immigrant Rights Alliance’s Alok Bhatt, argue that loopholes are leading to courthouse arrests. Sean Connolly was the only one who hesitated, saying it didn’t fit with his “style [of] collaboration” to get into a dispute with the feds. Several candidates also said they’d be open to funding legal aid for immigrants facing deportation cases. In 4,000 cases involving New Haven County residents, legal representation proved to be a strong predictor for who won relief from an immigration judge. During the pitch to the caucus members, most focused on amping up the crowd. 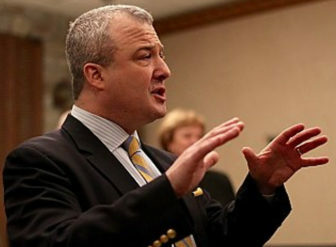 Jonathan Harris, a former state senator, state consumer protection chief, and West Hartford mayor, kept his pitch short with fewer than 10 words. Speaking with the Independent, Harris enumerated a much longer list of what he’d done for the state’s Hispanic population. As a legislator, he introduced a bill allowing undocumented students to pay in-state tuition rates at public universities. (Jodi Rell vetoed it; Dan Malloy later signed a similar version.) As head of consumer protection, Harris persuaded Medicaid to reimburse payments for medical interpreters, cracked down on notarios without a law license and simplified language on the department’s forms to be more readily understandable to non-English speakers. 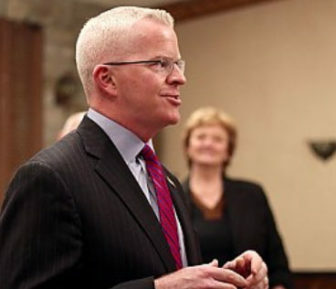 Sean Connolly, the former state commissioner of veteran services, said that newcomers today should have the same opportunity that his Irish grandparents found in Connecticut. He closed with a sentence in Spanish that earned cheers: “Ellos están conmigo. Quiero que ustedes estén conmigo tambien!” Translation: They are with me. I want you to be with me too! Susan Bysiewicz, who’d just officially declared her entry into the gubernatorial race, said she worked hard to diversify state boards and commissions when she served as secretary of the state. Bysiewicz said she planned to elevate the need for more federal funding for the cities that have taken in Puerto Rican evacuees — a bipartisan effort that would require getting Connecticut’s elected officials, both Democrats and Republicans, to pressure the White House. Guy Smith, former CEO of Americares and a liquor distribution company, said he’d stand up to the Trump administration. “In my administration,” he said, “we’re going to have serious diversity and serious candidates from your community, and I will protect every citizen in Connecticut from you-know-who in Washington.” The line implied non-citizens wouldn’t get the same protections, earning a tepid response from the audience, at best. The biggest applause of the night went to Kevin Lembo, the state comptroller. He originally launched an effort to seek the Democratic gubernatorial nomination this year, then surprised everyone when he dropped out, citing personal reasons. He’s running for reelection. In the attorney general race, Chris Mattei, a former federal prosecutor, and Clare Kindall, a former assistant attorney general, described different approaches to how they’d respond to Trump’s crackdown on undocumented immigrants. Kindall said she, too, would try to help the Dreamers by “doing everything permissible,” but she pointed out the limits of that strategy in a courtroom. “The state does not set immigration policy,” she said. “I wish I had a magic bullet.” Kindall said the resources of the attorney general’s office could be best used by defending sanctuary cities from retaliation and by looking into funding public defenders in immigration court, if they could get insurance. Some candidates — including gubernatorial hopeful Luke Bronin and attorney general candidate Paul Doyle — arrived too late to make presentations, but in time for some last-minute schmoozing. Gubernatorial candidate Ned Lamont sent representatives in his stead; Joe Ganim, another gubernatorial hopeful, later said he hadn’t received the invitation. This story originally appeared April 5, 2018, in the New Haven Independent.